Flagellum was a buzzword for most people in 9th grade biology. But Reuben Ramphal, a professor of medicine, keeps this bacterial organ at the forefront of his research. Flagella are known for helping unicellular organisms achieve locomotion and travel to their desired location. But Ramphal’s research suggests that bacterial flagellum doesn’t exist solely for mobility. Most recently, Ramphal’s research has uncovered that the Pseudomonas bacterium stops making its flagella when it enters the lungs. His hypothesis is that if the body recognizes flagellum, it will mount an attack against the bacterium. “Dr. 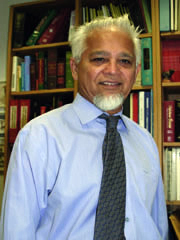 Ramphal has an active and distinguished research program that has placed him among the leaders in his field,” says Edward Block, chair of the Department of Medicine.